A first time visit to Seven Springs is a full sensory affair. That glow and grin you’ll see is a direct result of the Seven Springs aura, a chance to park the car and embark on village life with a no-worries vibe, a ski or snowboard vacation that doubles as an escape. 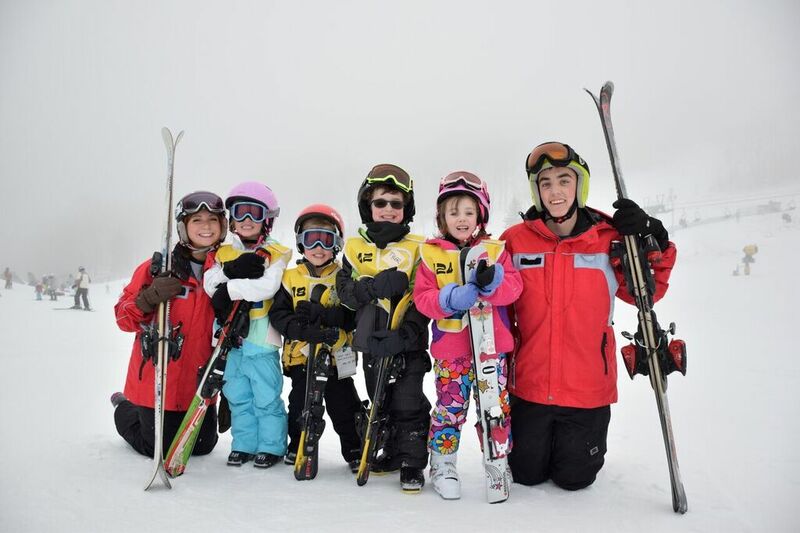 One of the main reasons your Seven Springs ski holiday will feel so carefree is because every logistic, from securing equipment and accommodations to setting up your lessons, is as easy as hopping onto the chairlift. Uncork Seven Springs and you let the good times flow. Getting started down the hill couldn’t be easier. For example, Seven Springs offers a series of “Winter Fun Packages” with something for everyone. 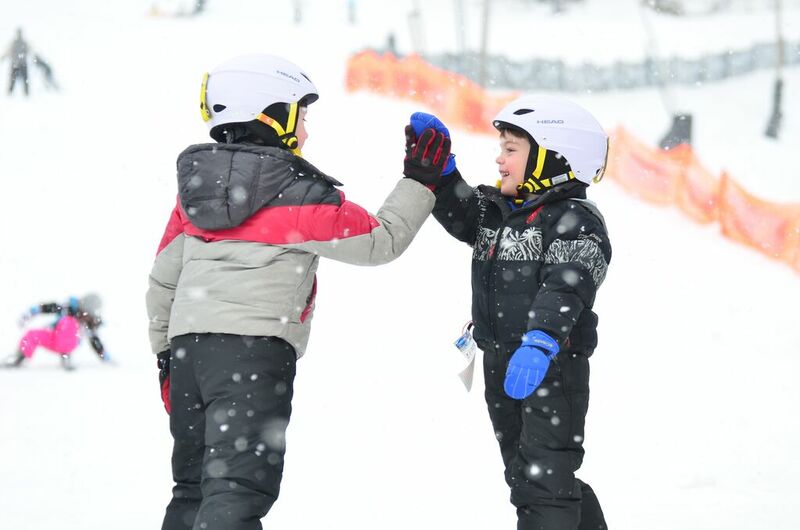 Winter Family Memories features two nights of lodging, free pizza and breakfast, multiple passes to non-ski activities and unlimited skiing and snowboarding over the entire length of the visit. 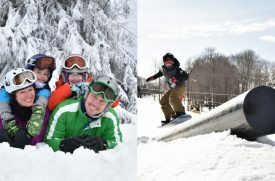 Rails to Rails also offers unlimited skiing/snowboarding with emphasis on 7S’s seven progressive terrain parks to go with one night’s lodging, perfect for an intro weekend. 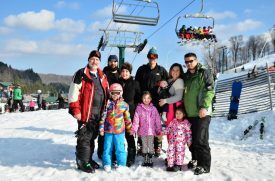 Seven Springs ties a bow on holiday packages with a “Holiday Family Memories” package to celebrate the season. 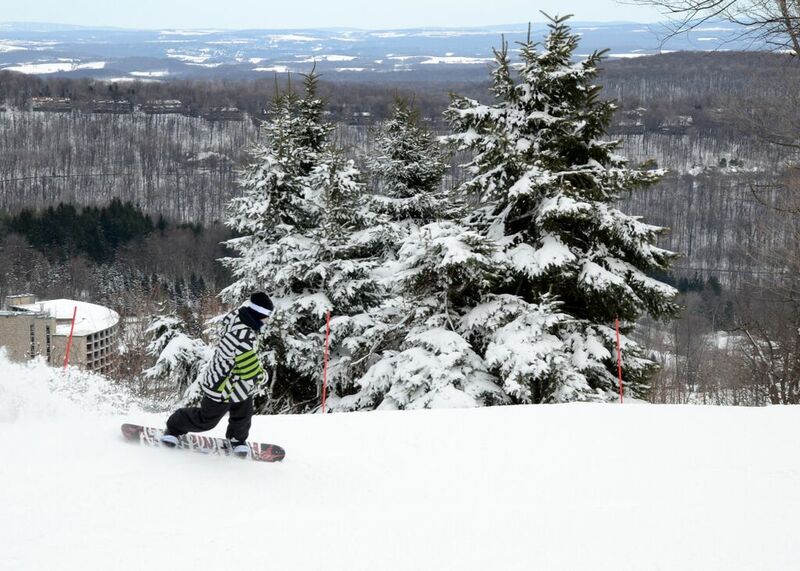 There’s even the Highlands Ski Package, an opportunity to ski or snowboard at all three of Pennsylvania’s premier ski resorts. Once you select how you’ll sleep, it’s time to set up your ski or snowboard equipment. Seven Springs is one of just 40 exclusive North American resorts that partners with Rossignol and Burton to ensure all levels of skier and snowboarder receive the latest top gear to rent. Though we often assume these high-performance packages are intended for advanced skiers, the truth is this responsive equipment is ideally suited for beginners as well. Seven Springs takes pride in welcoming the curious to the exhilarating skiing and snowboarding lifestyle community. They understand the best experience depends on excellent equipment like well-fitted boots, proper poles and, of course, skis or snowboards of the latest ride and glide technology. You can purchase your rental package at a discount online, saving time when you arrive, have your fitting and head out to the snow. Check out these package deals! Like your gear, lessons come in many customizable forms, from Tiny Tots to teens to ages 16 and up. You can join a group lesson, take a smaller group workshop, or step into private instruction, a great way to hone your skills while also learning where to go on the hill. 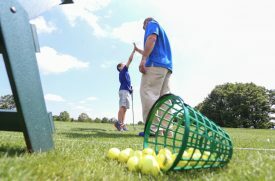 Beginner groups enjoy exclusive use of shallow slopes designed specifically for learning to stop and turn with plenty of room for practice. 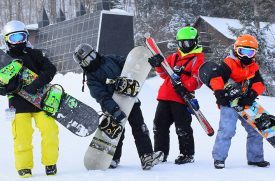 Like securing your lift tickets and gear, signing up for lessons is as easy as visiting 7springs.com. 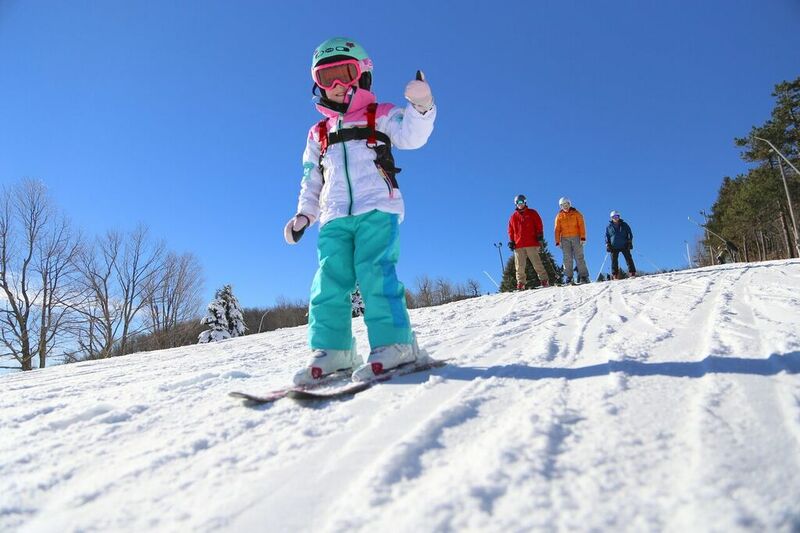 Seven Springs Mountain Resort offers the perfect terrain for a beginning skier or snowboarder to practice, gain confidence and progress to more challenging terrain. Unlike many mountains that reserve the easiest runs for the bottom of the hill, Seven Springs features gentle sloping runs in the heart of the mountain so that early skiers and snowboarders can experience the thrill of traversing all over the mountain. Fawn Lane and Phillip’s Run trails are just two of many examples of how you can access a full mountain experience. It’s an easy transition to adjacent intermediate runs once you have your skis or board under you. Naturally, there are plenty of trails for every level of skier and snowboarder, so feel free to bring your experienced friends along with you. A dip into the Seven Springs off-mountain memory log reveals teen and family gatherings at the Main Lodge’s bowling alley at night. 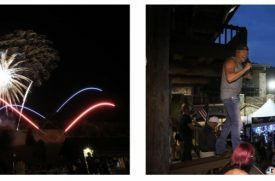 “Make sure to get reservations before you go, but some of the fun is what you discover once you arrive, weekend after weekend as well as holiday breaks were a blast,” observes the Pittsburgh native. 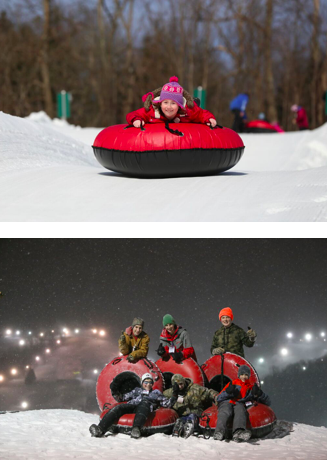 Adventure junkies may catch air from first chair to last run but you’ll also find the adrenaline rush-inclined gliding down one of 11 chutes on the snow tubing course or snowshoeing up mountain on trails that traverse the beautiful Laurel Highlands. Bowling takes a different meaning on the lower level of the Main Lodge, a great gathering spot for friends and families. Inside play only gets better, a virtual indoor Olympics, with eighteen holes of mini-golf, roller skating and the Bear Trap Fun Zone with more than 60 different games such as Skee Ball, classic pinball as well as the latest arcade games. There’s no reason to sit and stare out the window of your accommodations at Seven Springs, except that it’s so nice to do exactly that. The recently renovated Main Lodge Hotel is home to everything from studios to full kitchen suites, more than one dozen restaurants and bars, a heated indoor & outdoor pool, hot tub and yes, the bowling alley. Families and friend groups may wish bunk together in condos and townhouses that come in a variety of 1 to 4-bedroom floorplans. Seven Springs also offers several cottages, gorgeous private homes with river stone fireplaces, heated floors and other unique rustic details. 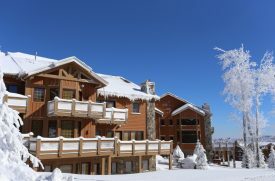 There are also more than one dozen chalets, gorgeous settings that can house as many as 18 guests! Still looking for a little more? Check out Fin ‘n Feather, the resort’s estate consisting of a lodge, guest house and carriage house just waiting for your once-in-a-lifetime gathering. Like the ski hill and lodging, dining comes in many forms. 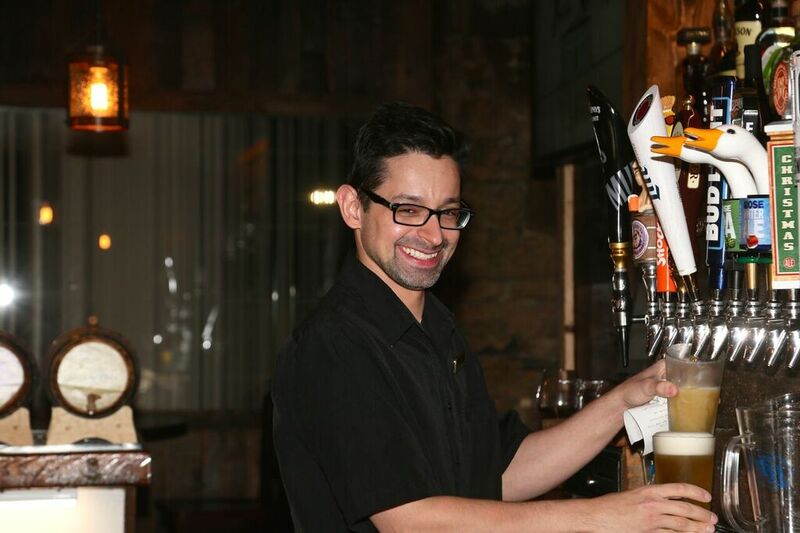 Pub crawlers flock to Foggy Brews and the Matterhorn, also known for late nightclub shenanigans, lounge lizards settle into the Bavarian or Seven Ten Bistro. 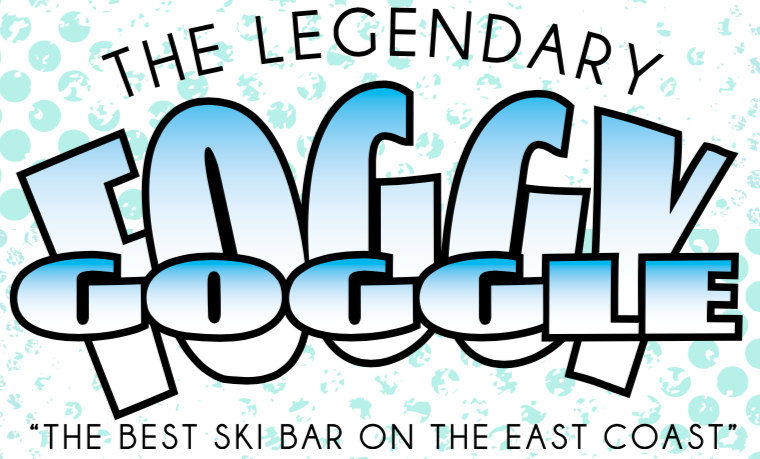 Of course, après aficionados head straight into the Legendary Foggy Goggle, one of North America’s best post-piste saloons. It’s not only sudsy times here however, fine dining resides inside Helen’s, Timbers plays host to families with burgers, etc, and the Pizza Place serves well, pizzas, as well as salads and hoagies. There’s also grab-and-go among other options as well, all within easy walk of the Main Lodge. Newbie or seasoned ski bum, you’ll find every food angle slope-side on your magical vacation within the Laurel Highlands. Almost everyone remembers the first time he or she strapped on skis or a snowboard and took to the slopes. Your novice run is most often an exhilarating rush that just keeps getting better. Seven Springs has ticked off every element for your ski or snowboard vacation, beginning with easy access to rental gear, lessons and the mountain itself. 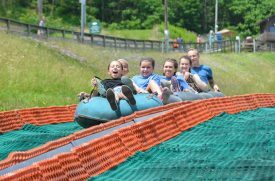 Push off on your path to discovery by visiting the Seven Springs Mountain Resort website.